Keywords are used to find symptoms in EH. With this new function, "themes" are used to find remedies. A theme is a collection of symptoms revolving around the same content, e.g. "simultaneous". Several symptoms may express this theme, yet the word "simultaneous" may not be used in the symptom text. Besides themes, there are other collections of information for which you can search. A collection is information that belongs together. The main concepts, abilities, or parts of the patient's history are examples of collections. Also, all typical symptoms belonging to a remedy constitute a collection. When you want to use a theme or a collection, you need to have a deep understanding of the mind of the patient. You can then define which theme runs through his history. This may be lead directly to the indicated remedy. In this first version, search by Themes and Collections applies only to the Materia Medica, "Hypothesis Collection - Primary Psora and Miasmatic Dynamic" by Per Neesgaard, Denmark (in English and Danish), who has done all the preliminary work. To learn more about this approach read the book "The Man, the Miasme and the Modality - a Homeopathic Paradigm" by Per Neesgaard. 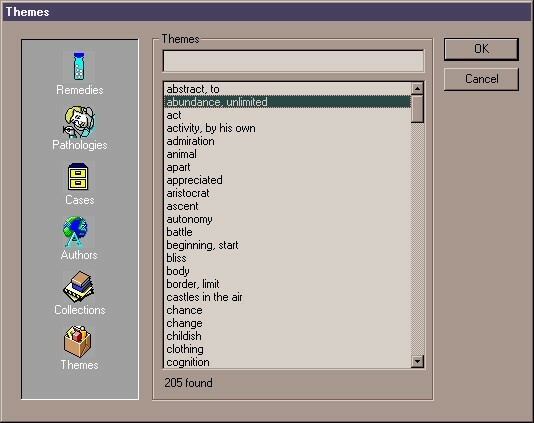 Themes and Collections can be accessed in two windows. You can double click on a Theme or Collection in the list in the Welcome window, e.g. on "abundance, unlimited": you will see the list and/or the text of the remedies related to this theme. In the search window you can enter a word and then, in the drop down list, select the word followed by "(theme)" or "(collection)". Only words present as a theme or a collection have this extra mention between brackets. If you type "simultaneous" you can then select the entry "simultaneous (theme)" . This will limit your search to all text related to the theme "simultaneous". You can also search for more than one theme/collection or still add another search item such as a word. If you type "respect (Collection)" and "family", you will find the symptoms containing the word family in those remedies where "respect" is a collection. A patient of mine, an architect, came for increasing faintness. The case taking revealed that the primary abilities had to do with his way of working. He was unable to delegate or do one thing at a time, but always focused on conducting the whole project at the same time. So I have been using: "Plans, projects (Collection)" and "Simultaneous (Collection)". The analysis shows china. Masi's Hypothesis from 1990 convinced me to prescribe Chin. 10-M, one dose cured him permanently (11 years ago). In addition, Themes and/or Collections can be used to make a differential diagnosis. In the search window, select "dd (chapter)" and then enter the remedy you want to investigate. 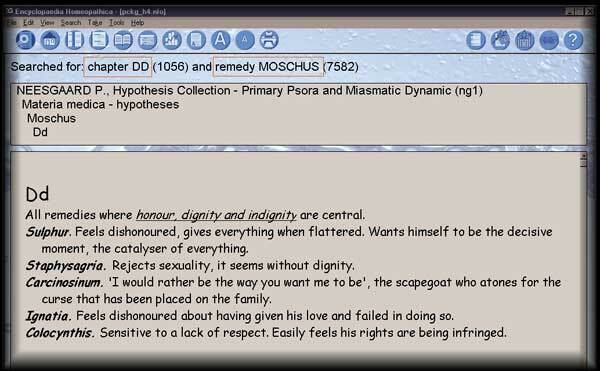 If you type "Dd (chapter)" and "moschus (remedy)", you see a differential diagnosis for moschus using a comparison with the themes of five other remedies. This will only work for the remedies described in ng1.